In addition to loving beer and Scotch, I'm pretty passionate about staying healthy. I eat reasonably healthy food and work out regularly. I believe it is possible to balance a healthy lifestyle with any of life's pleasures. On this page, I hope to share some thoughts on this and links to other articles that I like about health, fitness and nutrition. Cheers to your health! If you click the button to the right, you'll be taken to a recent article I wrote for a local newspaper about how to keep tasting beer while adhering to your healthy New Years Resolution. 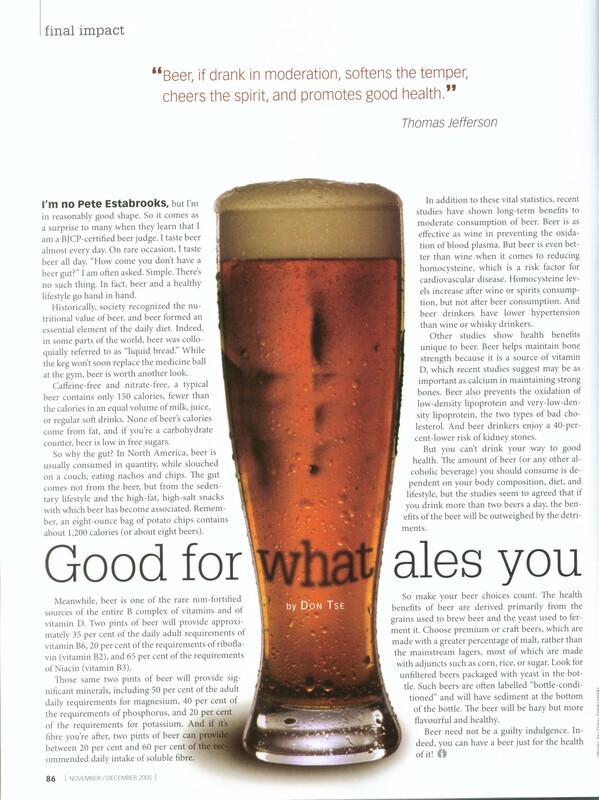 Here's another article I wrote a few years ago for Impact Magazine about the health benefits of the moderate consumption of beer. The Brewer's Association is the American trade association for craft brewers. Here is an article from their website on the health benefits of beer. It has long been known that beer reduces the risk of kidney stones, but here is a recent article with new theories as to why. Here's an article from Women's Health about the health benefits of using beer in your grilling marinades. The Academy of Nutrition and Dietetics is the world's largest organization of food and nutrition professionals. Here is an article from their website on the health benefits of beer. Here's a fun article listing some of the health benefits of beer. It has a casual tone, but that doesn't mean it isn't right! Here's a nice summary of some of the health benefits of beer, prepared by Webstaurant Store. Here is a great website from the British Beer and Pub Association devoted to the health and nutritional aspects of beer. Here is the website from a European conference on beer and health. It has some highlights from the conference and there are also some sporadic updates on beer and health. At least one study has concluded that drinking beer is better than drinking water for hydration after a strenuous workout. The sample size was small and the greater hydration was not substantial, so I'd take the study with a grain of salt. Nonetheless, the results were heavily reported, so here is the study, as reported by the Daily Mail. Beer is made with the hop flower, but there is a substance in the hop bract, not typicially used in brewing, that could be good for your teeth. Maybe brewers will start using the bract or maybe there are trace amounts of the relevant substances in the hop flower as well. One can always hope! My wife is a nutritionist, a doctor of Traditional Chinese Medicine and an IFPA-NPAA Pro Figure competitor. She knows a thing or two about health, wellness and fitness. Her website, My Health Site, features short articles on nutrition and fitness. Click the button to the right to visit that site. Some of the most popular excuses people employ to avoid exercise are to say they don't like going to the gym, travel too much or don't have the right equipment. Click the link to the right to watch a YouTube video of some excellent body-weight exercises. Yes, some of these exercises do require apparatus, but most of them do not. You can do these exercises in your home or in a hotel room. No excuses. Mercola is one of my favourite sources for health and nutrition information. They take a very critical look at the food and nutrition industries.